1. Heat oven to 350°F. Grease bottoms only 2 (8-inch or 9-inch) round cake pans with shortening or cooking spray; lightly flour (or spray with baking spray with flour). 2. In large bowl, beat cake mix, water, oil, lemon peel and eggs with electric mixer on low speed 30 seconds. Beat on medium speed 2 minutes, scraping bowl occasionally. Pour into pans. 3. Bake 8-inch rounds 27 to 32 minutes, 9-inch rounds 23 to 28 minutes, or until toothpick inserted in center comes out clean. Cool 10 minutes. Run knife around sides of pans to loosen cakes; remove from pans to cooling racks. Cool completely, about 1 hour. 4. Place 1 cake layer, rounded side down, on serving plate. Spread 2/3 cup pie filling over layer. Top with second layer, rounded side up. Frost side with frosting, building up a slight edge at top of cake. Spread remaining pie filling over top of cake to frosted edge. Store loosely covered in refrigerator. I reorganized and cleaned the china cabinet. Before view with the door closed. I doesn't looks too different but I think it looks a little less cluttered with the door closed in the after picture. This is what it looks like now with the door open. The right drawer had a lot of stuff in it before I organized it. I moved the candles to my candle storage in the basement. The seed packets went to the shed with the planting stuff. The ribbon went to the ribbon box in my little office. The spice jars got bagged and stored in another cabinet until I decide to use them. And the bird ornaments I made a couple years ago got rehung in my kitchen. This is after cleaning out the drawer. I plan to hang some plates over the main wall in my kitchen so the hangers should get used soon. This is the before picture of the right drawer. I keep our most frequently used cloth napkins and a prayer book and cards in this drawer. This is the linen before I reorganized. This is after I removed all the candles and straightened up the linen. This is the decor on the top of the china cabinet. I cleaned and reorganized my kitchen wall decor. I removed the plates from the plate rack and washed them. They got put back in the rack all nice and clean. I removed the tea cups and washed them along with dusting the flowers and bird cage. The tea cups were returned. This is a paper towel bar but we don't use paper towels much so I decided about a year ago that I had to find something else to hang on it so I went with tea cups. My over the stove decor before I cleaned and reorganized. This is after most of it was removed. I put everything back after I cleaned the shelf and decor. 1. Mix butter and dry pudding mix in large bowl. Gradually add boiling water, stirring until well blended. Stir in powdered sugar, 1 cup at a time, mixing well after each addition until mixture forms a ball. Shape scant tablespoonfuls of the pudding mixture into 60 small eggs, each about 1-1/2 inches long. 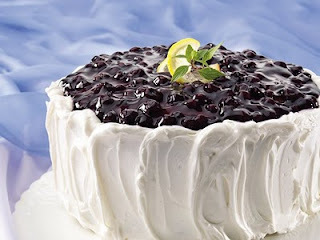 (If pudding mixture is too soft, refrigerate about 15 minutes to firm slightly before shaping.) Refrigerate 30 minutes or until eggs are firm. 2. 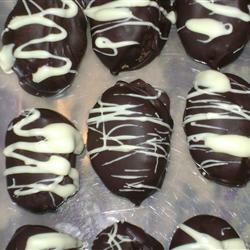 Microwave semi-sweet chocolate in microwavable bowl on high 1-1/2 to 2 minutes or until slightly melted. Stir until chocolate is completely melted. Dip eggs into chocolate. Refrigerate on wax paper-covered tray 15 minutes or until chocolate is firm. 3. Meanwhile, microwave white chocolate in separate microwavable bowl on high 1-1/2 to 2 minutes or until slightly melted. Stir until chocolate is completely melted. Drizzle white chocolate over eggs; let stand until set. Store in airtight container in refrigerator. While most of the dishes were in the dishwasher I remove the ones left in the cabinet and wiped the shelves and then put everything back. After the dishes in the dishwasher were finished I put those away. Preheat oven to 350 degrees and spray a cookie sheet with non-stick cooking spray. Heat the milk in a small saucepan until it bubbles; remove from heat. Add the butter and stir until melted; set aside. Put 2 cups flour, yeast, sugar and salt in a bowl, mix well. Add the water, egg and milk/butter mixture. Stir until everything is mixed together (this part will look sticky). Add the remaining cup of flour and mix until the dough starts to form a ball. Continue kneading for five minutes. Place dough onto a well floured surface. Roll out dough into a rectangle. Mix together the cream cheese and sugar; spread evenly over dough. Mix together the apples, cinnamon and sugar. Spread on top of the cream cheese. Roll dough up and form into a circle making sure the edges are sealed together. Transfer to cookie sheet and cut slits three fourths down into the dough, about two inches apart, all the ways around the ring. Bake in preheated oven for 25-30 minutes or until golden brown. Remove from oven; drizzle on some cream cheese icing (same as I used in the apple pizza) and sprinkle on some cinnamon. Mix 1st 4 ingredients and let rest for 15 minutes. Add salt and eggs – gradually add flour. 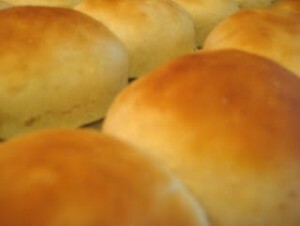 Shape into dinner rolls, or use in your favorite recipe that calls for dough. After shaped, let rest for 10 minutes. For rolls, Bake 10 minutes 400 degrees ‘till golden brown. Mix 1st 4 ingredients and let rest for 15 minutes. Add salt and eggs – gradually add flour. Shape into dinner rolls, or use in your favorite recipe that calls for dough. After shaped, let rest for 10 minutes. For rolls, Bake 10 minutes 400 degrees till golden brown. Score ham. Mix honey, brown sugar, and orange juice together. Rub mixture over scored ham. Place ham, fat side up, in roasting pan. Bake ham at 350 degrees F. for 2 ½ hours. Baste with juices during the last 30 minutes of cooking. In a large bowl, stir together all ingredients. Pour into a greased 9x13 glass pan (or 2 8x8 pans). Bake at 350 for 1 hour until browned. 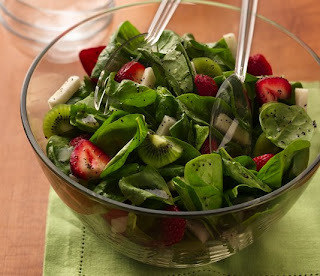 Toss spinach, coconut and fruit in large bowl. Drizzle with orange juice. Serve immediately. 1. In a food processor, add all of the dry ingredients and pulse a few times to get the ingredients mixed together. 2. Add butter to the food processor and pulse until butter is cut into pea sized pieces. This will take a few minutes. 4. Remove dough from the food processor and knead a couple of times on a lightly floured surface. 5. Roll out to 1 inch in thickness. Use a biscuit cutter or drinking glass to cut out into round biscuit shapes or cut into squares using a pizza cutter. 6. If freezing, place biscuits on a cookie sheet for about 1-2 hours, until solid. After they are frozen, place in a freezer bag to store. Use as needed. 7. To bake biscuits whether fresh or frozen: Place on an ungreased cookie sheet and brush with melted butter. Bake at 400 for 15-17 minutes or until top is golden. Halfway through the baking process, brush the tops of the biscuits again with melted butter. Makes 16-20 biscuits. I cleaned and organized my stove drawer. I took everything out and washed the drawer. I put everything back when I was finished. No purging required for this project, although I have consider getting rid of the blue bowls but we use them for chips at parties. I would have to decide if I have enough glass bowls to make up for them being gone. 1. Heat oven to 350°F (325°F for dark or nonstick pans). Grease and flour 15x10x1-inch pan, or spray with baking spray with flour. 2. In large bowl, beat dry cake mix, water, oil, egg whites and yogurt with electric mixer on low speed 30 seconds. Beat on medium speed 2 minutes (batter will be lumpy). Pour into pan. 3. Bake 24 to 28 minutes or until toothpick inserted in center comes out clean. Cool 10 minutes; remove from pan to cooling rack. Cool completely, about 1 hour. 4. Cut cake crosswise into thirds. 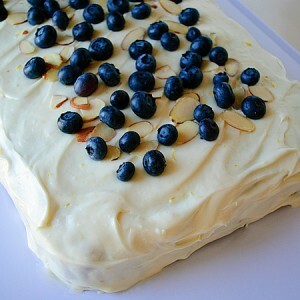 Place one-third on flat serving plate; spread with 1/2 cup of the frosting. 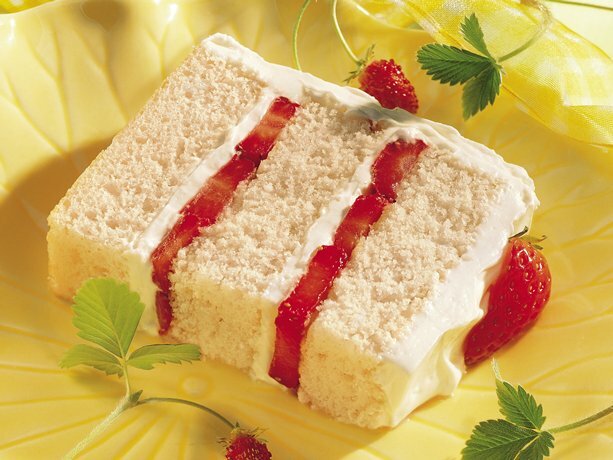 Arrange half of the sliced strawberries on frosting. Repeat with another third of cake, 1/2 cup of the frosting and remaining strawberries. Top with remaining third of cake. Frost side of torte with thin coat of frosting to seal in crumbs, then frost side and top. 5. Cover loosely and refrigerate at least 2 hours until chilled. 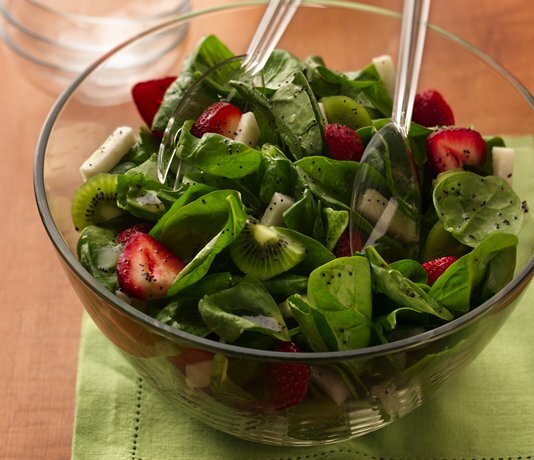 Before serving, garnish with berries and mint leaves. 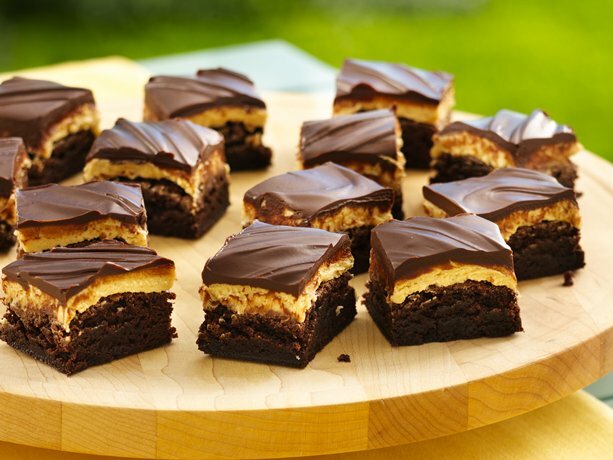 Cut into 12 slices; cut each slice in half. Store loosely covered in refrigerator. I cleaned, and organized my small appliances, pots & pans cabinet I did not purge anything with this project. I took everything off the top shelf such as pots & pans, lids, mixing bowls, strainers, and roasting pan I organized, cleaned the shelf and then put everything back. I did the same to my small appliance shelf except I also wiped them down. I wipe them down after each use but I wanted to do it again since other people in the house don't always. The crockpot liner & lid are in the fridge and the coffee pot & basket are in the dishwasher which is why the are not in the photo. 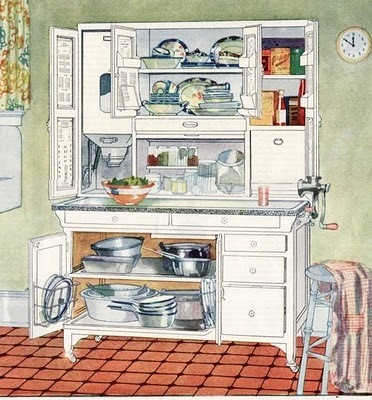 I store my extra appliances in the basement kitchen storage. The top and middle drawers slide out but I never do that except when I clean them. Appliances on the drawers slide out. I store my platers and baking trays on the bottom shelf. Everything clean and back in place. 1. 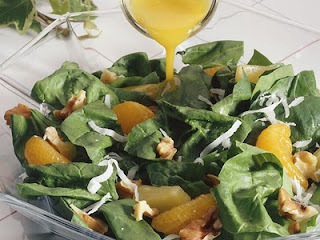 In a tightly covered jar or container, shake all the dressing ingredients. 2. Peel the jicama, removing the brown skin and a thin layer of the flesh just under the skin. The skin can sometimes be slightly tough. Cut about half of the jicama into about 1x 1/4-inch sticks to measure about 3/4 cup. Wrap remaining jicama and refrigerate for another use. 3. Peel the kiwifruit. Cut lengthwise in half, then cut into slices. Rinse the strawberries with cool water and pat dry. Remove the leaves and cut the berries lengthwise into slices. 4. Remove and discard the stems from the spinach leaves. Rinse the leaves in cool water. Shake off excess water and blot to dry with paper towels. Tear any large leaves into bite-size pieces. I decluttered, cleaned, and organized what I call my dinner cabinet and this is the before picture. This is everything out of the bottom shelf such as rice, pasta, potato flakes, bread crumbs, croutons, soup mix jar, gravy, rice kits. This is the middle shelf unloaded onto the counter. It has mac n' cheese, barley, helper kits, pasta sauce, mushrooms, ramen noodles, and split peas. This is the top shelf stuff on the counter I have lots of beans, and pasta. The two plastic containers was a purchase I made a couple weeks ago at Wal-Mart for $3.00 each. It is a failed attempt to have my beans all in containers. They are too wide and are not long enough to fit my cabinets but I will have to deal with the two I bought until the beans are used up and then I will take them out of this cabinet. I wanted ones similar to the blue ones that I have on my bottom shelf and I wanted them to go all the way across the shelf. I guess I will just keep stacking the bags since that has worked the best so far. This is the after picture of my dinner cabinet. I actually added 3 boxes of mac n' cheese from my basement food storage. Breading crumbs, chicken sauce mix, and french fried onions is what went into the trash. Heat oven to 350°F. Grease bottom only of 13x9-inch pan with cooking spray or shortening. 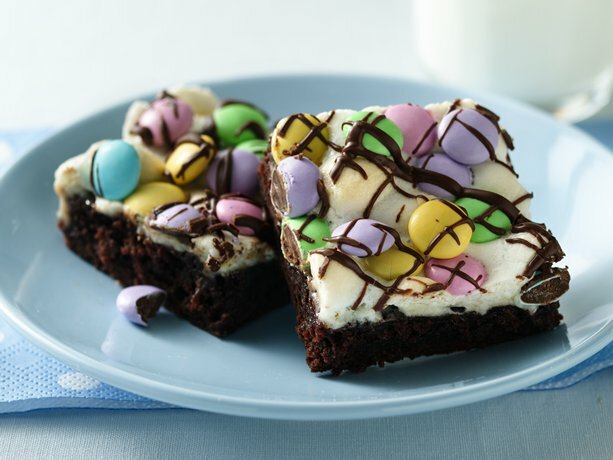 Make brownies as directed on box for 13x9-inch pan, using water, oil and eggs. Bake 23 minutes. Sprinkle with marshmallows; bake 5 minutes longer or until marshmallows are puffed and golden. Sprinkle with candies. In small microwavable bowl, microwave chips and shortening uncovered on High 15 seconds; stir. Drizzle over bars. Cool completely, about 1 hour. For easier cutting, use plastic knife dipped in hot water. For bars, cut into 6 rows by 4 rows.